Joseph Ball Shelley was orphaned at the age of four and by the age of fifteen he had become an attorney’s clerk. His step-father, Samuel Hartshorne, was working in partnership with the pottery firm Ferneyhough & Adams, Dresden Works, Stafford Street, Longton. By 1858 the works had passed into the hands of Shelley and Hartshorne. This partnership only lasted until 1861, to be succeeded by a partnership between Joseph Ball Shelley, James Adams and Harvey Adams. The company traded under the name of Shelley & Adams. This partnership only lasted a year and in 1862 Joseph Ball Shelley’s connection with the pottery was terminated. In 1862 he joined Henry Wileman at the Foley China Works as a traveler. In 1864 Henry Wileman died (see section covering the Wileman family) and his two sons James F and Charles J Wileman took over running the business. In 1872, Joseph became a partner with James Wileman in the china works only. The name of the works changed from Foley China Works to Wileman & Co. 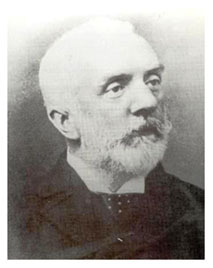 The influence of the Shelley family in the business was strengthened when Joseph’s son Percy joined the company in 1881. Father and son then started to build a reputation for themselves of being a company who produced good quality ware. In June1896 Joseph Ball Shelley died.